I owe an apology to Hasbro, the makers of the new iPhone Scrabble game. 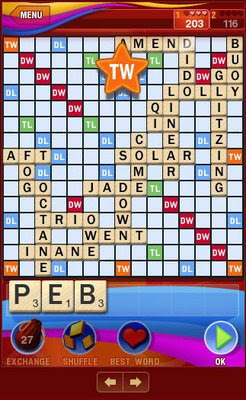 Both my W and I accused Hasbro of allowing the new iPhone Scrabble game computer player to play the two letter words, FE, KI, OI, QI and ZA. It ends up that according to the National Scrabble Association Dictionary Committee site, these words have been added to the Fourth Edition of the Official Scrabble Dictionary. I will be ordering mine on Amazon today. It looks like I'll also need a new electronic dictionary since there is no upgrade path for my old one. Here is a list of the new two- and three-letter words in the fourth edition of the Official Scrabble Players Dictionary.